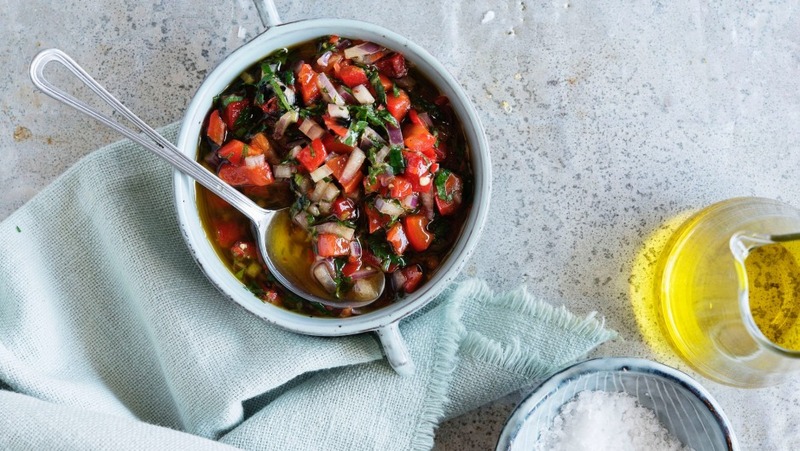 This salsa can be used with grilled fish, squid, prawns or vegies such as eggplant and sweet potato. Using the naked flame of the stove burner (if you have an electric stove use your barbecue), place the capsicums directly onto the naked flame. Blacken the capsicums heavily and then place into a bowl and cover with cling film. Let them sit for 20 minutes, then peel and dice. Take a mixing bowl and add the diced capsicum, red onion, garlic, parsley, chilli, lemon juice, lemon zest and olive oil. Mix well and season. Serve with our barbecued squid and grilled spring onion. Tip: When blackening capsicums on the fire, you want to see dark tones form under the skin. The reason why we let them sit covered for 20 minutes is that the capsicums steam in the bowl and this makes their skin a lot easier to remove.